Digital transformation is a key concern for businesses across Europe seeking to establish a competitive advantage, drive efficiencies and enhance services. As a concept this has existed for some time, but only now are leaders displaying confidence in their ability to incorporate and integrate technology to improve processes – and over a relatively short timeframe over the coming years. Indeed, with many well advanced along the path, it is timely to consider the ultimate goal of such transformation: full digital maturity. New research commissioned by Ricoh Europe reveals that digital maturity – where an organisation uses sophisticated tools to drive performance and demonstrates an on-going commitment to technology, technology-led initiatives and digitally managed processes – is now a priority for 77% of businesses across Europe and the Middle East. Interestingly, the study found that, across all sectors, education is the most progressive in terms of making the transition. More education leaders see digital maturity as a key priority (80%) than representatives from other sectors. Perhaps, given the opportunities that technology offers to educators, this should not be surprising. A new generation of students, always-on and digitally engaged, are likely to be attracted by enhanced classroom and online learning experiences. 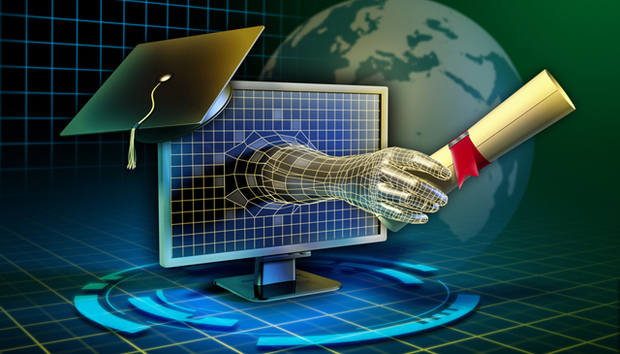 The rise of remote learning and massive open online courses (MOOCs) make it clear that the future of education has digital at its heart. Looking even further ahead and drawing upon previous research, employees expect workplaces of the future to feature emerging technologies including touch-based interactive devices, voice recognition, drones and augmented reality. All have obvious benefits they could deliver to the learning experience. Imagine a history module where an event could be experienced and interacted with, rather than just taught and discussed. In the immediate future, with interactive whiteboards now present in many classrooms and the increasing usage of mobile devices by students, the next five years will see real-time collaborative experiences becoming the norm. Less obvious, but just as vital, education leaders cite the back office benefits of digital maturity as a significant driver of change. These include improved business processes, easier access to information and less time required to complete tasks. Considering the potential for transformation in both its front and back-office, it is not difficult to explain why, when compared to other vertical sectors, education has the largest number of respondents seeing a stronger competitive edge as the number one benefit of becoming digitally mature. However, the research highlights that educators face both financial and cultural transformation challenges as they continue digital initiatives. The biggest barrier singled out by leaders is cost, reflecting the fact that the sector is often subject to the greatest restraints on expenditure as it faces the daily need to balance limited budgets across investing in people, facilities and technology. The 2013 OECD Education at a Glance report revealed a decline in public spending on education institutions in a number of European countries including Italy, Portugal, Spain and the United Kingdom. Additionally, despite a clear desire and progressive attitude towards achieving digital maturity, there is a self-confessed lack of knowledge about how exactly to fulfil the goal. The survey revealed that the education sector has one of the lowest percentages of respondents who have a clear vision for achieving digital maturity (71%), with only the Public Sector having fewer. The obstacles of cost and knowledge must not stand in the way of the education sector fulfilling its potential and leaders establishing themselves as digital pioneers. In order to safeguard progress, organisations must ensure they have the infrastructure in place to support digital maturity. For most, there is recognition that a greater reliance on internal expertise than in other sectors means that external support will prove crucial. The research showed that education leaders are more likely to say that working with an expert external partner would be critical to achieving maturity. For other sectors, the race is not yet lost. Change will be driven from the top. Senior teams must match the enthusiasm and appetite of their counterparts in education, where leaders are more likely to be engaged with digital activities and 62% are concerned and interested in keeping operations digitally mature. At the point where maturity is achieved, businesses in the education sector and beyond will need to remain committed in order to maintain their status. Regularly reviewing processes, enhancing ways of working and integrating new technologies will be central to realising this goal. Only then will European organisations fully transition from a period of digital transformation to an age of maturity, and be able to sustain it.